‘Patterns’ is an exhibition of work which uses patterns in some way. At its most basic, a pattern is a repetition, but patterns exist in nature, in cycles of the year, life and death, in light and words, and there are patterns of human or societal behavior. Featured artist Lacey Bryant will be presenting a new series of oils on patterned wallpaper, incorporating the patterning into her work. Contact Sandra at sandra@cactusgalleryla.com for pre-sale info. Participating artists: Murphy Adams, Jaclyn Alderete, Shannon Amidon, Ulla Anobile, Skye Becker-Yamakawa, Christine Benjamin, Lydia Rae Black, Andrea Bogdan, Michael Borja, Lauren Hana Chai, Joan Charles, Gigi Chen, Jon Ching, Nancy Cintron, Joshua Coffy, Katherine Dossman-Casalllas, Bob Doucette, Tulio Flores, Michele Guieu, Andre Hart, Annette Hassell, Benjamin Henderson, Mavis Leahy, Candace McKay, Malathip, Marni Manning, Avery Palmer, Kyle Pellet, Tania Pomales, Christine Rasmussen, Jenifer J Renzel, Francesca Rizzato, Chris Rodriguez, Joshua Roman and more. EXHIBITION / SALE continues through January 13, 2018. Kaleid Gallery 88 South Fourth Street, downtown San Jose. Thiis show at The Arsenal in Japantown will feature the work of 14 artists, creating their own renditions of the Loteria card. Willow Glen's newest skate shop presents "Skate Punks" a group show of local artists, skate themed art and many painted skate decks as well. Opening reception JULY 15th at the bG Gallery from 6 – 9 pm. “The Food Show” includes the following 50 artists: Adam Roth, Alden Marin, Alex Chiu, Annabel Osberg, Big Tasty, Bill Miller, Bradford J Salamon, Charlotte Goff, Daniel Edwards, Murphy Adams, Dave Kloc, Dave Quick, David Buckingham, David Friedman, Douglas Alvarez, Eva Lacey, Hilary Pfeifer, Jake Weigel, Jamie Polancic, Jermaine Rogers, Jesse Reno, John Kilduff, Joseph Remnant, JoshR, Justin Decou, Kat Philbin, KROSSD, L.A. GOAL, Laura Atchinson, LITTLE FRIENDS OF PRINTMAKING, Mark Hanauer, Mary Delioussina, Mayon Hanania, Melissa Monroe, Mike Boston, Mike Egan, Miles Lewis, Nancy Larrew, Noah Malloy, Dr. Paul Koudounaris, PooJazzle, Porous Walker, Robert Branaman, Rodman Edwards, Sarah Stone, Shaun Berke, Steven Snyder, Terri Berman, Trace Mendoza, Travis Millard, Tripper Dungan, XVALA, and Zachary Aronson. Mischief! I'll have about a dozen pieces in this mischievous group show at San Francisco's Studio Gallery. This is a fun little art pop up featuring art, pottery, hand knitting, art jewelry, and much more! I'll have some prints and cards there available for purchase. 1366 Lincoln Ave. San Jose, CA 95125 in Willow Glen near Starbucks on Lincoln and Minnesota. Every year we search the Bay Area for the tastiest art for Delicious, our show of artwork inspired by food and drink. For our 2016 vintage we've selected work from over 100 local artists: a cornucopia of work that depicts the food we eat, the places it comes from, the people preparing and serving it, and even the utensils we use to eat it. 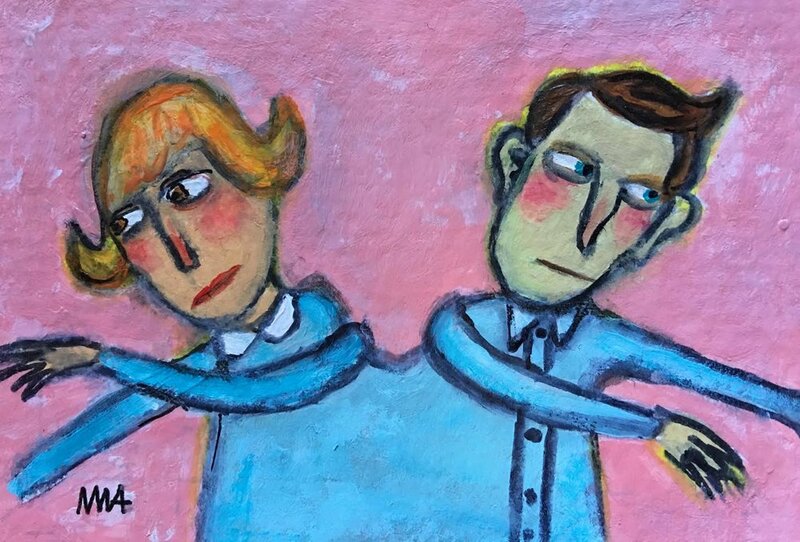 "Murphy Adams is a mixed media folk artist whose intentionally naive and raw style isolates moments of emotion in daily life and often strange internal thoughts. Ivy Atoms is a painter and comic book artist who's almost-human character designs express the complicated relationship with the physical form in a bizarre future that is always changing. Both artist’s colorful, figurative work share a self-aware and sometimes self-deprecating humor and narrative. “Leota” is a show about the often surreal feminine experience from two artists from different generations with lots of the same DNA."